This evening teaches you about the rainforest in fun and informative ways; with passionate music, bold visions, and careful analyses. 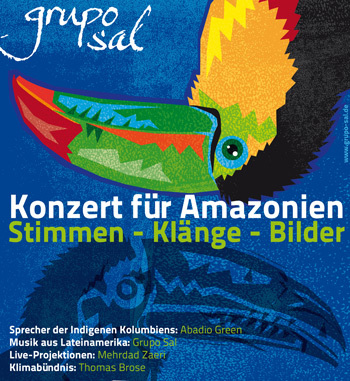 The programme “Concert for Amazonia” touches all the senses. It shows the rainforest from various perspectives: modern Latin American music, political analyses, reports, indigenous rituals and live-paintings. Abadio Green, the leading representative of the indigenous people of the Tule, takes the centre stage in this encounter. Abadio Green talks about the lifestyle of his people in a very personal and intimate way. He manages to convey the magic of the rainforest while reminding of the urgent threat this region is facing. During this “encounter of cultures”, Abadio Green meets Thomas Brose from the Climate Alliance. Green and Brose feel at home in both worlds, which makes them excellent mediators between the worlds. Green is not only accepted as the elder of his people but is also a lecturer for ethno-linguistics at the University of Antioquia in Medellin. Brose was a development worker in Brazil; today he is the manager of the Climate Alliance. Both present their point of view regarding the fight for the Amazonia in order to come up with visions and possible solutions together. Grupo Sal takes the audience on a journey into unfamiliar worlds and sets the tone. The passionate music stops the audience from being too affected by the serious topic and encourages it to look for change with a positive attitude. The light artist Mehrdad Zaeri approaches the topic in very unique and touching ways – with captivating images and forms, which he paints whilst projecting them in front of the live audience.